After being looted and sold to the Metropolitan Museum, the stunning collection of 3rd century BC silver pieces known as the silver hoard of Morgantina has come back to Aidone in Sicily. It’s an arduous task to get to this remote town, a real off-the-beaten-path adventure in Sicily, but I can assure you that it’s worth the trip. On a recent visit, I found the silver pieces breathtaking – exquisitely crafted bowls, drinking vessels and other pieces left me and other lucky visitors gasping in awe. The silver hoard is beautifully displayed in the tiny archeological museum of Aidone, and in the same museum you will find the Goddess of Morgantina, a Greek statue that also has a murky past, having come home to rest after having been looted and sold to the Getty Museum. 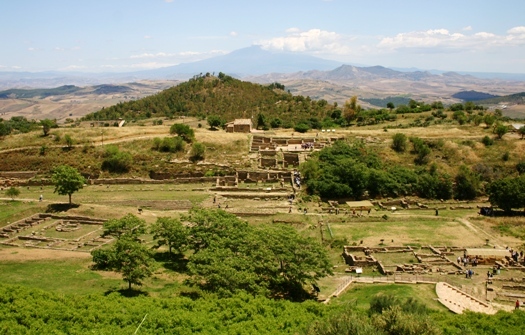 We can include a visit to the Morgantina archeological site, Aidone archaeology museum as well as the spectacular mosaics at Piazza Armerina on a private tour in Sicily. The looting, sale and investigation of the Morgantina silver is also a fascinating story. 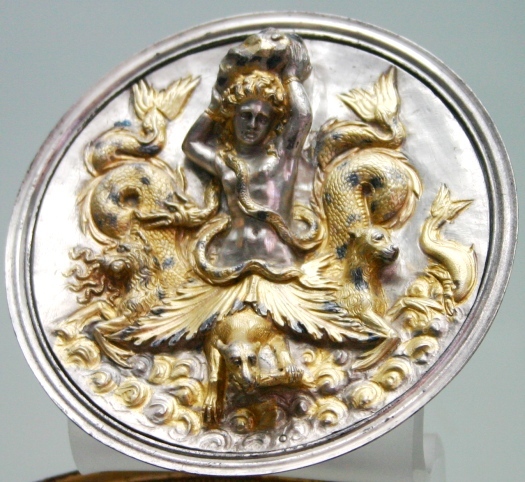 Considered to be among the finest Hellenistic silver known from Magna Grecia, the pieces were purchased by Metropolitan Museum of Art in the early 1980’s for $2.74 million from Robert Hecht Jr,, an American dealer in antiquities that is currently in trial in Italy for conspiring to deal in stolen artifacts. Robert Hecht Jr is now 90 years old and the statute of limitations runs out in July 2011, so it is doubtful he will ever be convicted. It was also an American, the archeologist Malcom Bell III, who championed investigations at the archeological excavations of Morgantina, and eventually proved that the silver hoard had been stolen. The Metropolitan Museum agreed to return the Morgantina silver hoard to Italy, but retains joint custody of the pieces, allowing the Met to have the silver pieces for an exhibit every 4 years. When the Morgantina silver came to Italy in February, the Met received a recently excavated 20-piece Roman dining set from Pompeii for a temporary exhibit.